When the company of Tenderloin, working as an ensemble, recreates the look and feel of the city streets outside the theatre doors, the effect is uncanny. The sounds, the gestures, the body language, the dress perfectly recreate the neighborhood. This is theatre absolutely rooted in its community and it is an impressive accomplishment. You can practically smell the sidewalks. The evening doesn’t quite hold together dramatically, as the series of monologues and occasional conversations that comprise the show are loosely linked and there is a lack of plot. Granted, there is some tension generated in the exploration of the recent political history of the Tenderloin and the conflicts that have arisen between real estate interests and activists but this is not the main point of this show. That point is to sympathetically bring to the stage the real life personalities who live and work in the Tenderloin and on that account the production is an unqualified success. Based on actual interviews with local residents, the monologues are true-to-life, funny, touching, enlightening and lovingly crafted by a fine company of actors who have paid attention to detail. All of the characters in this play are real people; you can meet them on the streets of the Tenderloin and many will be immediately recognizable. The San Francisco Playhouse’s artistic director Bill English has described theatre as “…an empathy gym where we come to practice our powers of compassion.” With Cutting Ball Theater’s production of Tenderloin, audiences and actors get a heck of a satisfying workout. 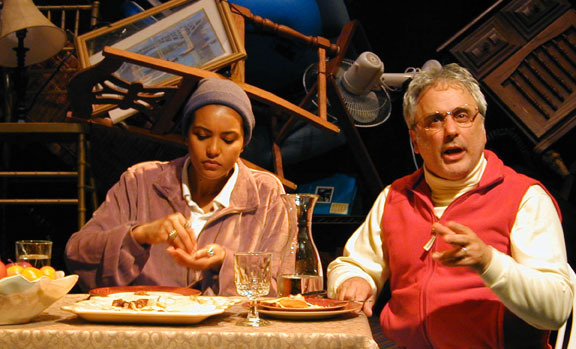 Tenderloin continues at Cutting Ball Theater through May 27. For further information click here. Posted in Reviews.Tagged Annie Elias, Cuttingball Theater, David Sinaiko, Erin Moro, Frederic O. Boulay, Leigh Shaw, Matt Stines, Michael Kelly, Michael Locher, Michelle Mulholland, Rebecca Frank, Siobhan Doherty, Stephanie Buchner, Tenderloin, Tristan Cunningham.